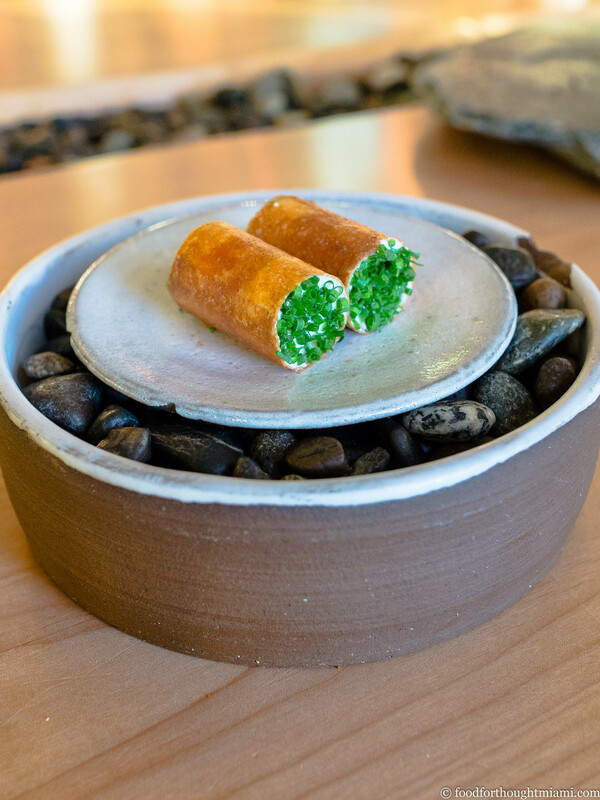 In Situ, the new restaurant in the recently refurbished and reopened San Francisco Museum of Modern Art, is a bundle of contradictions (read my thoughts and see all my pictures from In Situ). 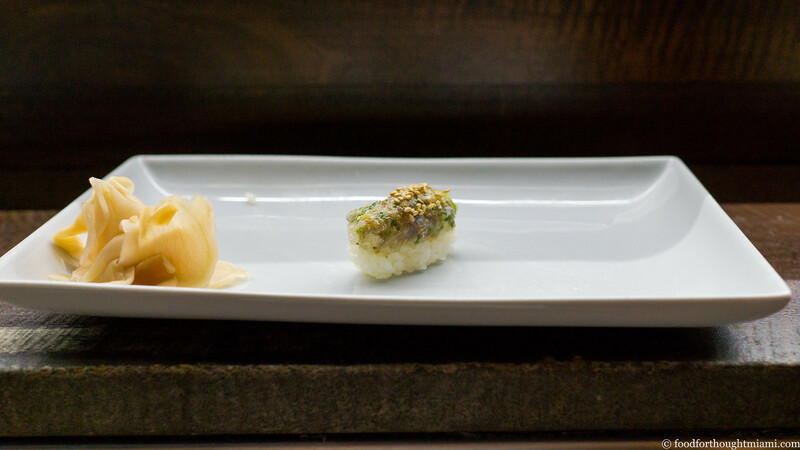 The chef is Corey Lee, whose tasting-menu flagship, Benu, just retained the three Michelin stars it was first awarded in 2014. 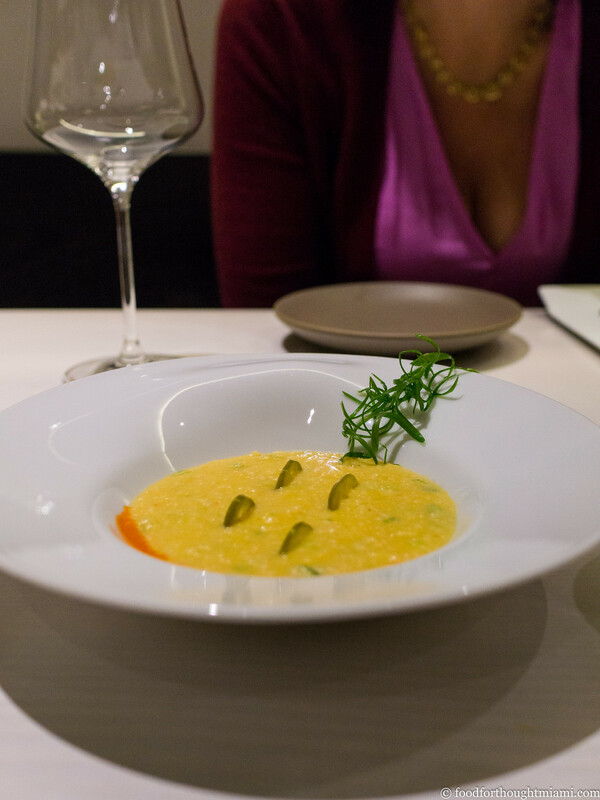 But the highly regarded chef didn't create a single recipe for the restaurant. 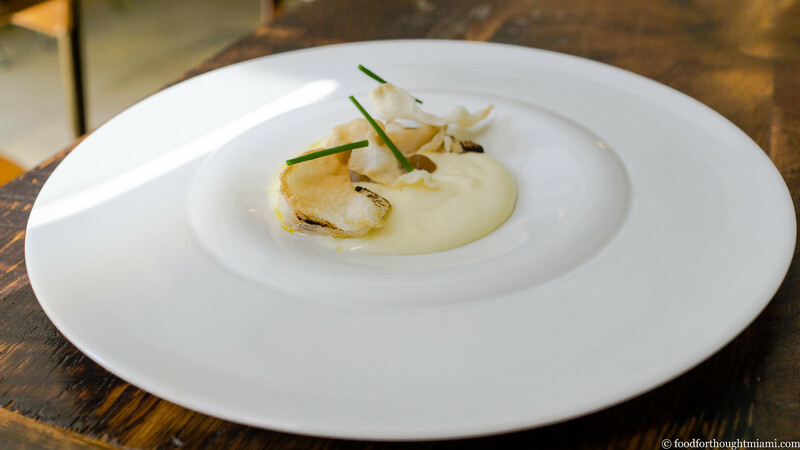 Rather, the menu consists of a rotating selection of other chefs' dishes from all around the world, which the In Situ kitchen sets out to faithfully recreate. In other words, it's a restaurant in the model of an art exhibition, with Lee as the curator. The lead-off item on the menu during our visit comes from chef Wylie Dufresne. His restaurant in New York's Lower East Side, wd~50, was a mid-aughts "molecular gastronomy" trendsetter. But I never managed to get there before it closed in 2014. Yet here are Dufresne's "shrimp grits," a dish which subverts the classic Southern pairing, turning the shrimp themselves into the grits by chopping, cooking, finely grinding, and finally re-warming them with powdered freeze-dried corn, then garnishing with pickled jalapeños and a bright orange shrimp shell oil. On our last visit to San Francisco of the year, we also happily squeezed in a brunch at Cala, Gabriela Camara's Mexican restaurant (see all my pictures from Cala). I was infatuated with the place from the moment we walked into the brightly sunlit dining room. 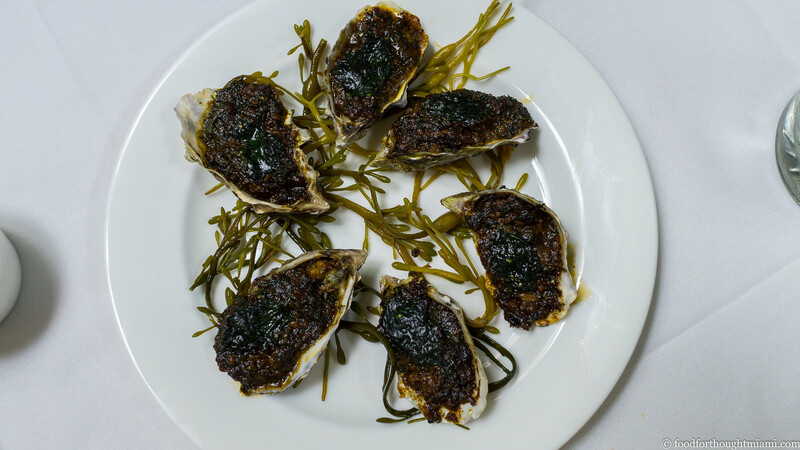 The food was every bit as mesmerizing, especially these wonderful grilled oysters topped with a dark, burnished paste of caramelized carnitas and nettles, just a little bit like a Mexican Oysters Rockefeller. I'm eager to make a return visit for dinner. 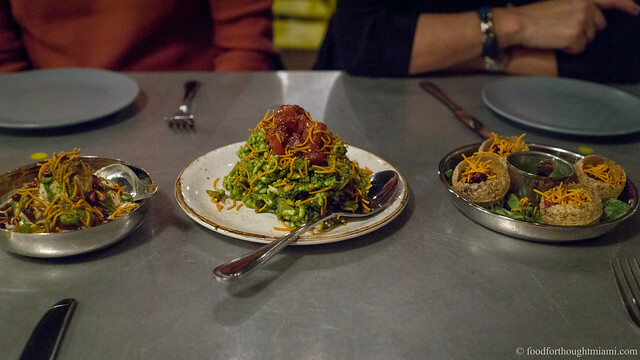 Yet one more dispatch from our last SF trip, this one from Brandon Jew's new Chinatown restaurant, Mister Jiu's, which revitalizes Cantonese banquet style cuisine with some California sensibilities (see all my pictures from Mister Jiu's). 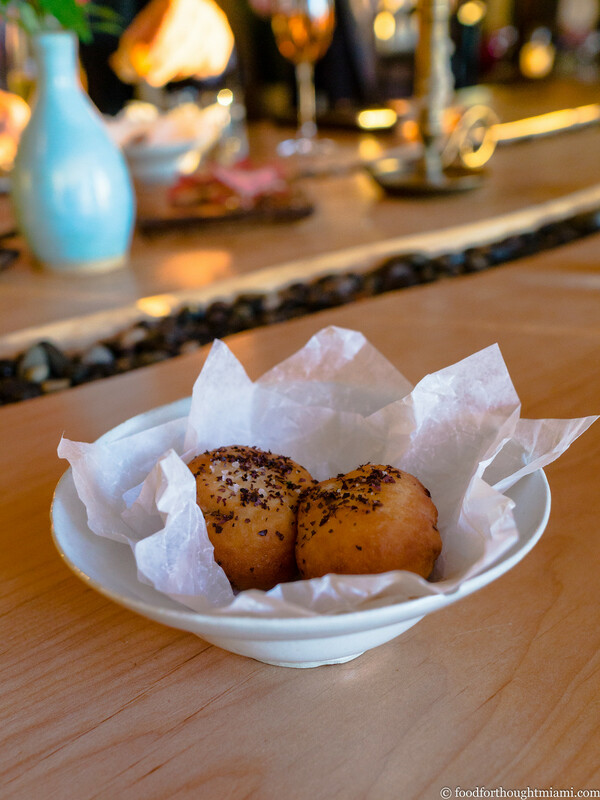 So you'll find things like sourdough scallion pancakes with salmon roe, and dutch crunch BBQ pork buns (those are every bit as good as they sound). 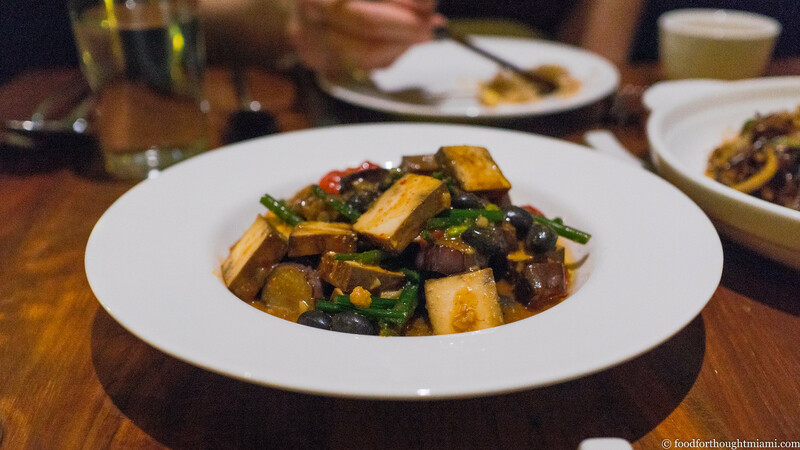 But the surprise favorite dish for me was one which combined smoked Hodo tofu with fresh shelling beans, rounds of Machiaw eggplant, and a burst of fresh red chiles – substantial and satisfying but still very fresh and clean. 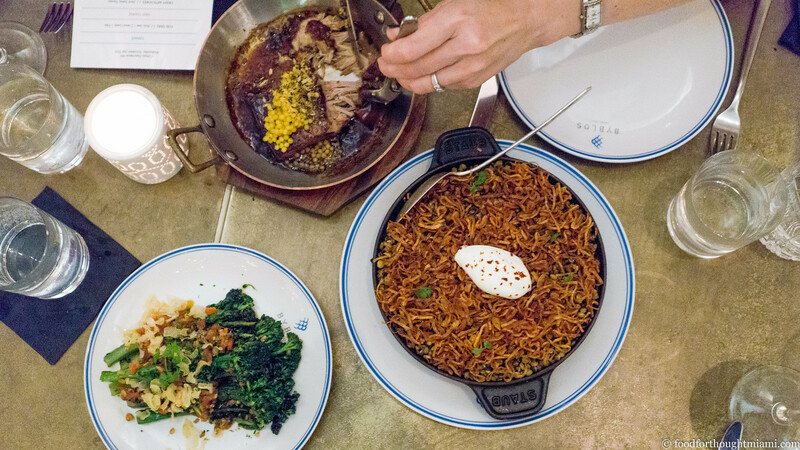 The short version is this: despite my general aversion to South Beach hotel restaurants, especially those by big out-of-town restaurant groups, I think Byblos is putting out really flavorful, contemporary Middle Eastern food in a beautiful space and providing excellent service. Even shorter: I really like it. fire roasted pork belly on black olive and blood flatbread - Edge at P.I.G. Seven years ago, about twenty-five folks gathered at the Harvey Seeds American Legion Hall for a celebration of all things porcine, orchestrated by Chef Jeremiah Bullfrog, and P.I.G. (Pork Is Good) was born. I faithfully reported on the event here. Jeremiah's done P.I.G. every year since, and every year it's gotten bigger and better. No longer a one man show, the event now brings together dozens of my favorite chefs in South Florida, plus some special out of town VIPs, and hundreds of attendees. I have repeatedly said that this is my favorite food event of the year, and the latest iteration only validates that (read my thoughts and see all my pictures from P.I.G. #7). 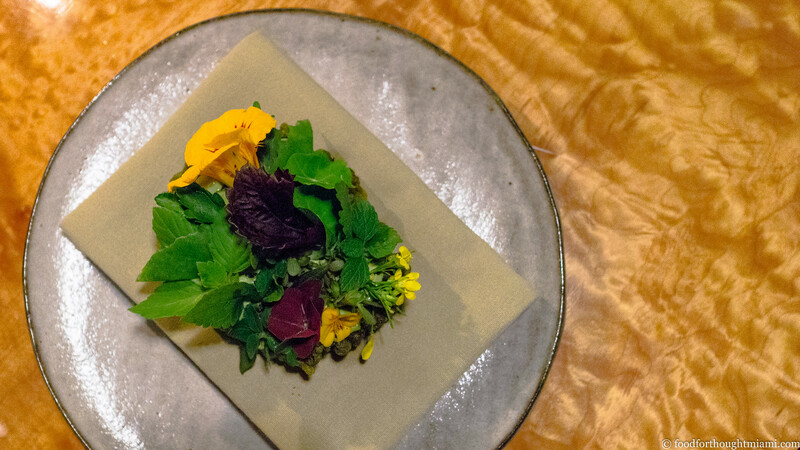 Every time there's one of these events, there's one guy in particular who always brings his "A" game: Aaron Brooks, chef at Edge in the Four Seasons Brickell. 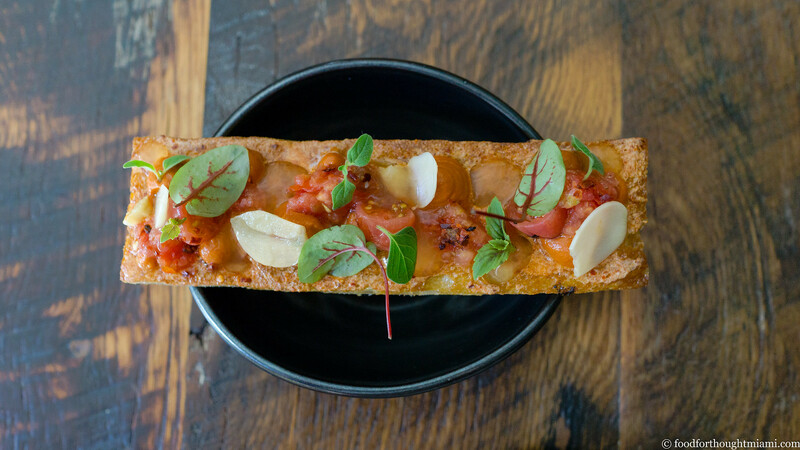 Edge is, in its way, a most unusual kind of place: a restaurant hidden inside a swanky hotel that's become a local's favorite because Brooks' cooking is so damn good. But when he gets out of the restaurant, it seems like Brooks can really spread his wings. 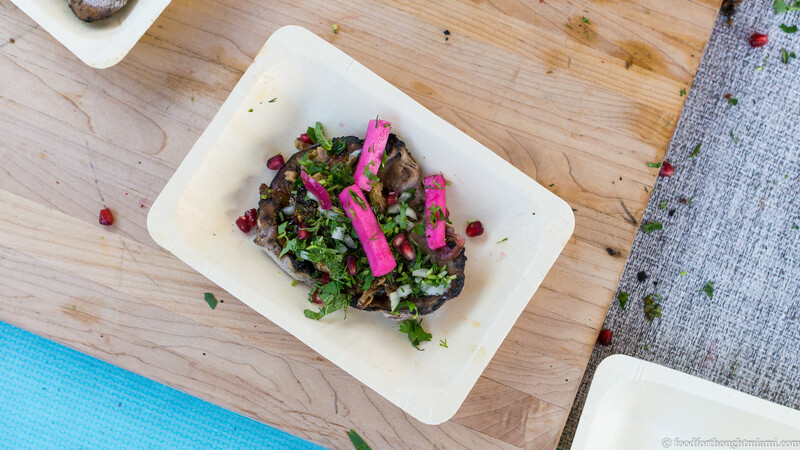 Like with this pork belly roasted over open fire, served on top of a charred black olive and blood flatbread, topped with pork fat tahina, pomegranate chermoula, and hot pink turnip pickles. It was incredibly good. charcuterie - Craig Deihl, Cypress at P.I.G. 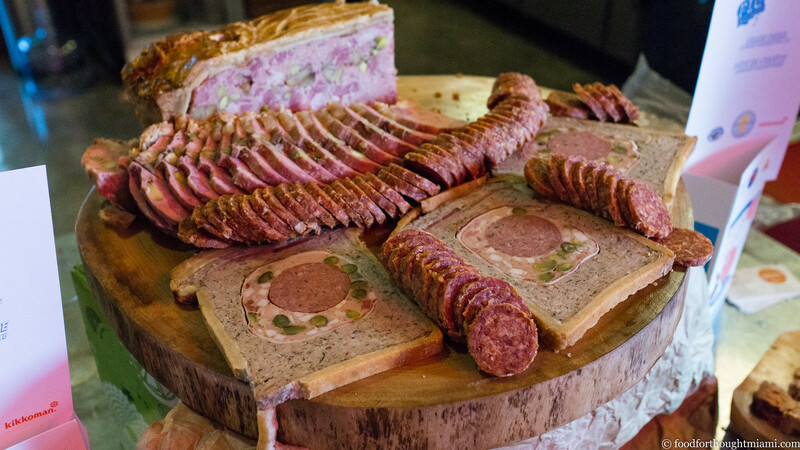 Craig Diehl, of Cypress in Charleston, South Carolina, makes charcuterie that will make your mind melt. His station was already pretty picked over by the time I got there, but I did get to try the two pâtés en croûte he prepared, and they were incredible. Miami lost a real talent when Nina Compton, who had been the chef de cuisine at Scott Conant's Scarpetta, headed for New Orleans to open her own restaurant, Compère Lapin (see all my pictures from Compère Lapin). It's been incredibly gratifying, but not at all surprising, to see how enthusiastically she's been received in a town that already had its share of great restaurants (including, this past month, recognition as "Restaurant of the Year" from the New Orleans Times-Picayune). We finally got a chance to try for ourselves a couple weeks ago, and it was every bit as good as we anticipated. 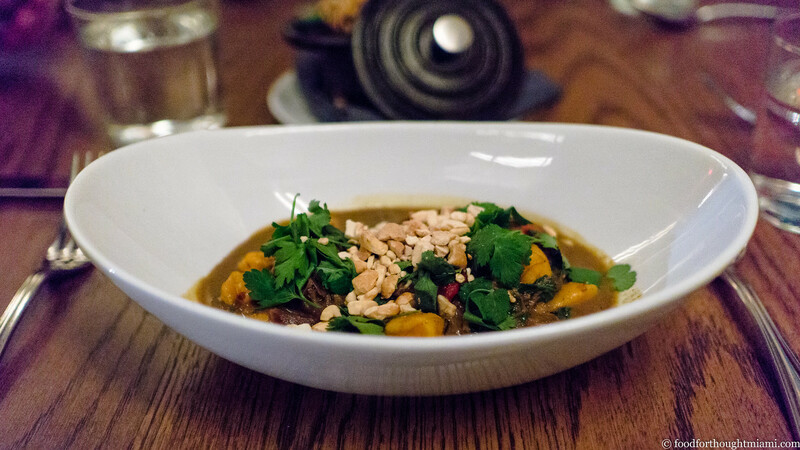 This dish – sweet potato gnocchi bobbing in curried braised goat topped with toasted cashews – is one that Nina's probably going to be cooking until she retires. It's the perfect encapsulation of her merger of Caribbean flavors and Italian technique, executed flawlessly. Also new to New Orleans since our last visit is Alon Shaya's modern Israeli restaurant, Shaya (see all my pictures from Shaya). It used to feel somehow just wrong to eat anything other than Creole or Cajun food – or maybe Vietnamese – while in New Orleans, but those days have changed. It's always been a great food town, but it's also become a much more diverse one in the post-Katrina era. You've had it a thousand times: hummus and pita. And yet you've probably never had it this good. I sure hadn't (though not to be too humble about it, when I make from-scratch hummus using a hybrid of Ottolenghi's and Solomonov's recipes, it's pretty damn good). Shaya's pita hits the table hot from the oven, erupting with steam as you pull it apart, simultaneously fluffy and light but also substantial and hearty. 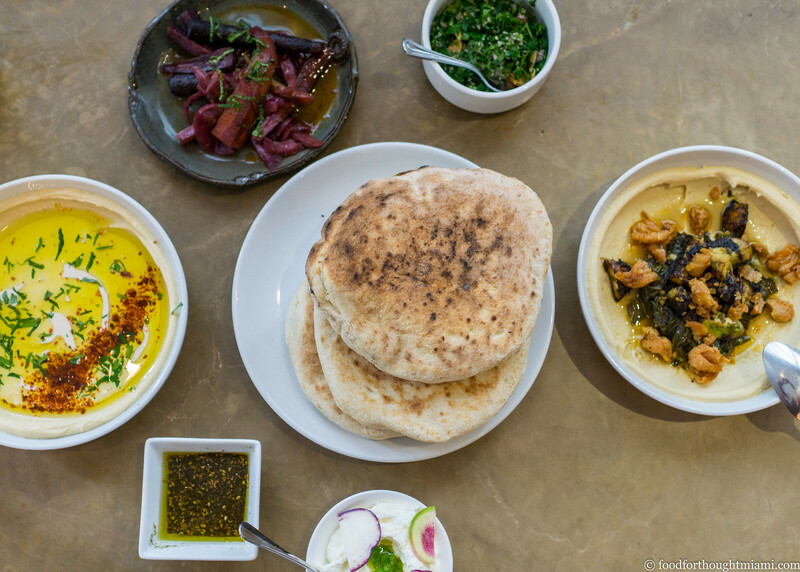 And the hummus is delightfully silky and rich when just bolstered with an extra lashing of tahina and olive oil, but reaches new heights when topped with sautéed king trumpet mushrooms, braised greens, black harissa and gribenes. I could eat this every week. Sac-a-Lait is another new addition to the New Orleans dining world, from husband and wife chef team Cody and Sam Carroll, who also run Hot Tails in Baton Rouge (see all my pictures from Sac-a-Lait). 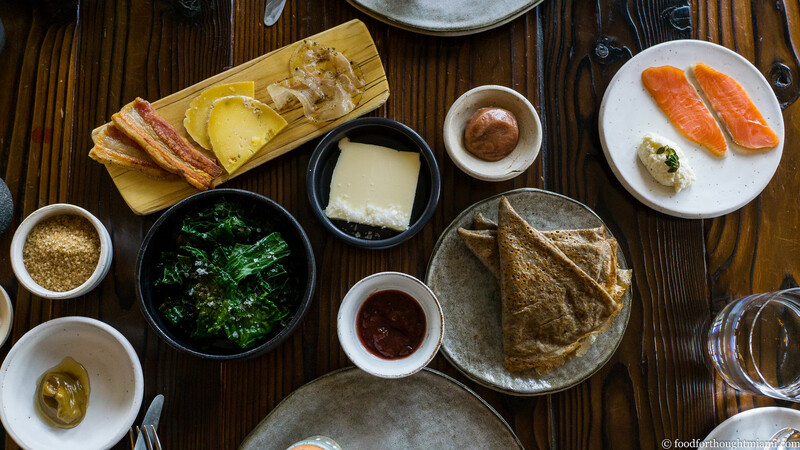 With Sac-a-Lait, they aim to bring a little country to the city, focusing on native ingredients and flavors, but doing it with refinement and creativity. So the deviled crab uses Pontchartrain crabmeat mounded over whipped egg yolk and a Crystal sabayon, under a tepee of black-hued crackers. Black drum collars are dusted with Cajun spices and served over a black lemon honey and a sassafras chimichurri. 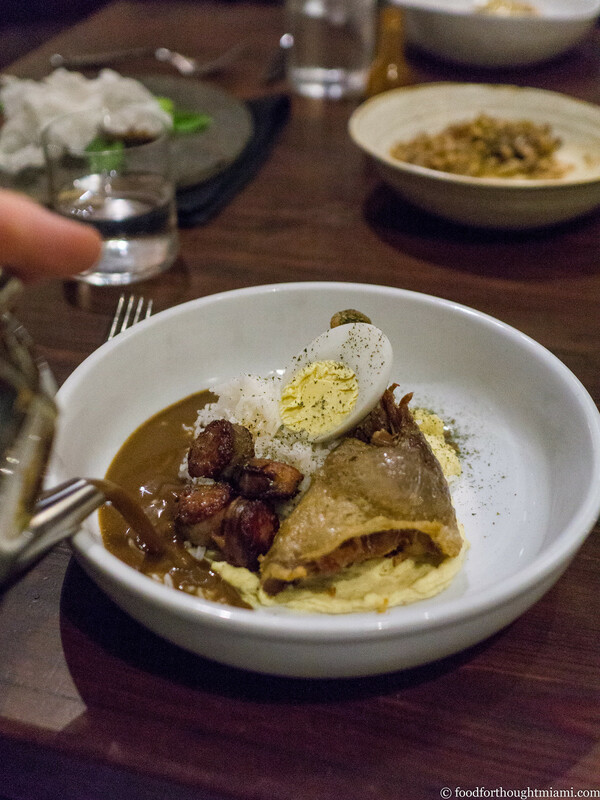 But the best dish we had was the one that was maybe the least gussied up: a gumbo with crisp-skinned duck confit, incrediby tasty acorn-fed pork andouille sausage, and hard-boiled egg, with a dark, complex roux-enriched broth poured into the bowl tableside. My Louisiana guru Chadzilla has already taught me that potato salad is at least as common as rice as a gumbo accompaniment in Cajun country, so I was happy to see both here. And to close out 2016, I recently made a return to another of Miami's best restaurants – Naoe (read my thoughts and see all my pictures from my last visit to Naoe). 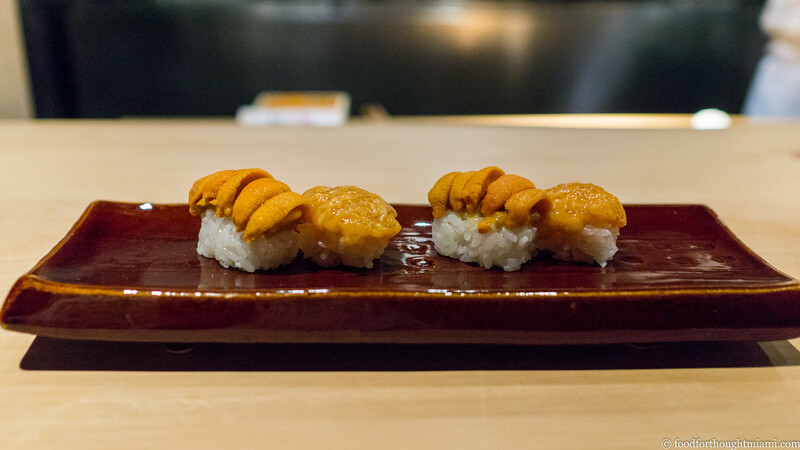 When Naoe first opened, I couldn't quite believe it even existed: a tiny omakase-only restaurant serving a bento box laden with an assortment of treasures, prepared in a Japanese style but using fresh, often local, seasonal ingredients, followed by a piece-by-piece procession of the best sushi I'd ever had in Miami. Happily, Naoe has thrived, and it was such a pleasure to celebrate – just a few months early – its eighth anniversary with chef Kevin Cory and his wonderful, charming, do-everything sidekick, Wendy Maharlika. The meal was lovely as always, mixing the fresh and local (kingfish sashimi straight from local boats pressed with seaweed, kombu-jime style) with extraordinary seafood shipped in from Japan, in particular this sweet, fruity Hokkaido uni, paired up with the intense marine funk of konoko (salt-pickled sea cucumber innards). Well that's it. 2016 is done in six hours, and I don't think my home-made Hoppin' John is going to make this list anyway. Thanks for following along here, and while I say it every year, I mean it every time: thank you to all the chefs, cooks, waitstaff, sommeliers, bartenders, busboys and dishwashers, all the farmers and fishermen and forargers, all the winemakers, brewers and distillers, all the guinea pigs at our Cobaya dinners, and all the wonderful people I've had the good fortune to share meals with, both in person and vicariously. As my grandfather used to wish us each year: always better, never worse.